It's FREE and takes about 7 seconds! Would you like to create your own crosswords for a class you teach, a newsletter you publish, or maybe to liven up your website or blog? The tool I use for this site is called Crossword Compiler. 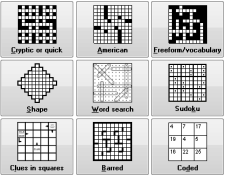 The picture above shows all the types of crossword puzzle templates it has installed for quick-and-easy puzzle construction (Sudoku? What's that doing there? Blasphemy!). The application ships with a tonne of built-in word lists and a tool that automatically creates all the crossword-fill for you and even works out the clues! What's left for you to do? Well, if you want your puzzle published in the New York Times, you'll want to tweak the fill and the clues to get something truly fun and creative. But if you just need to create a crossword puzzle in a hurry, you can have one ready in less than a minute! The main reason I got hold of Crossword Compiler was to create puzzles for this website. Click on the image below to see the online version of the crossword puzzle I created for Issue 4 of my Word Buff Stuff! newsletter. While you're there, have a go at it if you like! In my interviews with professional crossword constructors, I discovered that virtually all of them use it (even though some made the transition to the digital world reluctantly). Actually, that's how I found out about it. So here's where you can check it out and have a play.